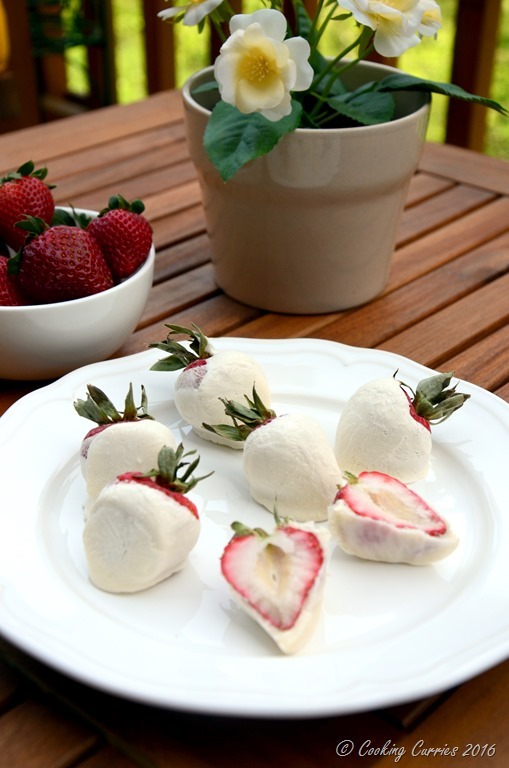 Delicious, juicy, organic strawberries coated with thick Greek yogurt and frozen to make these adorable summer frozen treats, frozen yogurt covered strawberries, that will be a favorite with kids and adults alike. I first wrote this post back in early 2014 for my old blog, Mirch Masala. It is such a lovely story, that brings back a lot of memories that I did not want to rewrite it all over again. The little baby boy is a little kiddo now and I can’t believe how quickly time has gone! He now talks a LOT and has a ton of opinion about things and “Why?” is his favorite response to anything and everything. We try to be very patient with him and try to explain the “why”s and not just dismiss it as “because we said so” but it is really very difficult to come up with an answer to some of his questions and convey that to him in words and sentences and concepts that a 3 1/2 year old would understand. So anyhow, strawberries are here a little earlier this year and I can’t wait to go for some strawberry picking with V this year. I have a killer recipe for a strawberry basil lemonade and a strawberry chia jam that I recently made for a brunch party and everyone loved, that I cannot wait to make again and write all about it here. 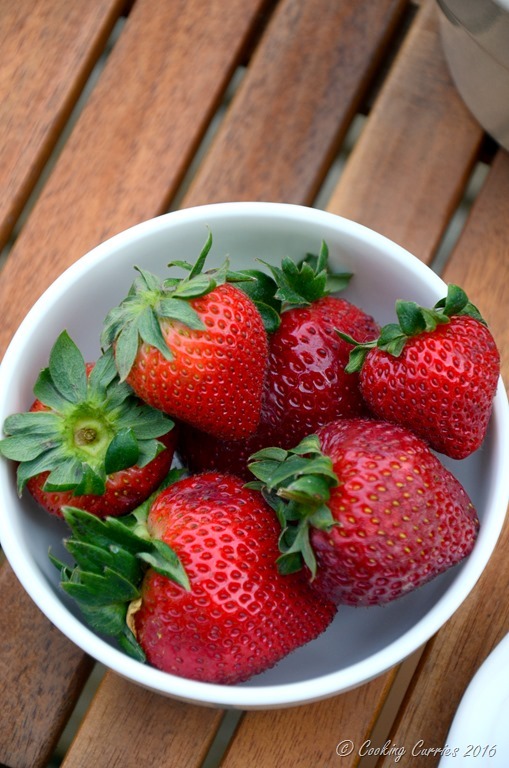 Hopefully this weekend, some of the farms we love are open and we get to go and pick some strawberries. Till then, enjoy this frozen treat that kiddos and adults will love! Lil V loves all fruits, especially strawberries. It is so cute to see when he signs “more” after he is “ah-dah” (all done) with his meal to get his dessert course, which is mostly fruit. If he specifically wants strawberries he signs “more” and says “sa-sa” which means strawberries. Lately, we have noticed that he says “sa-sa” for all berries. All other fruits are “ah-puh” (apple)! Lil V is teething a lot now. He got 3 teeth in the last few weeks which makes it a grand total of 5 and there are at least 3 more on their way. He has been flaunting his new teeth with his silly smiles and keeps pointing to them and says “tee-tah”. With all that teething and the weather getting a whole lot warmer, I thought I would make these frozen treats for him to help soothe his gums. It is just amazing how he has been adding to his vocabulary and how many more words he is repeating after us (in his own cute way) and he is just 16 months old!I am sure it is no big deal and all kids that age do that, but it IS a huge deal for us and we always think back to how little he was exactly a year ago! I just realized how many lil V stories come out in these Little People Food posts. After all, it is Little people and lil V has to star in them! Right?! 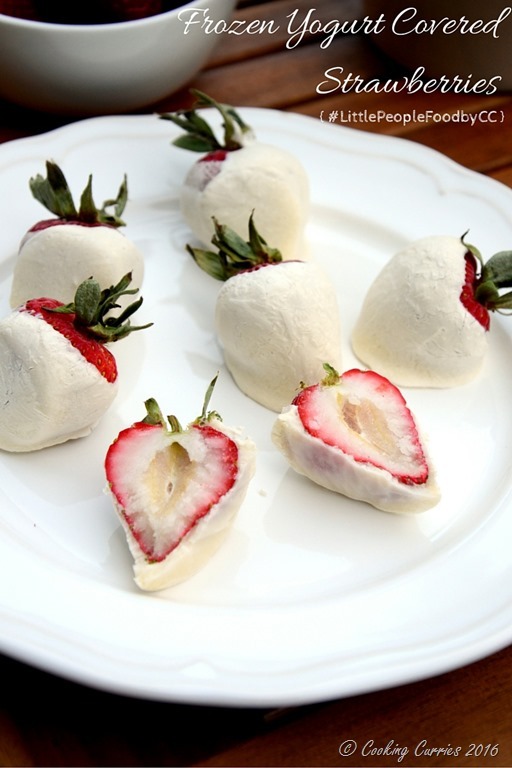 Going back to the strawberries, these are amazing frozen treats for the little ones and they are not just your regular chocolate covered strawberries. 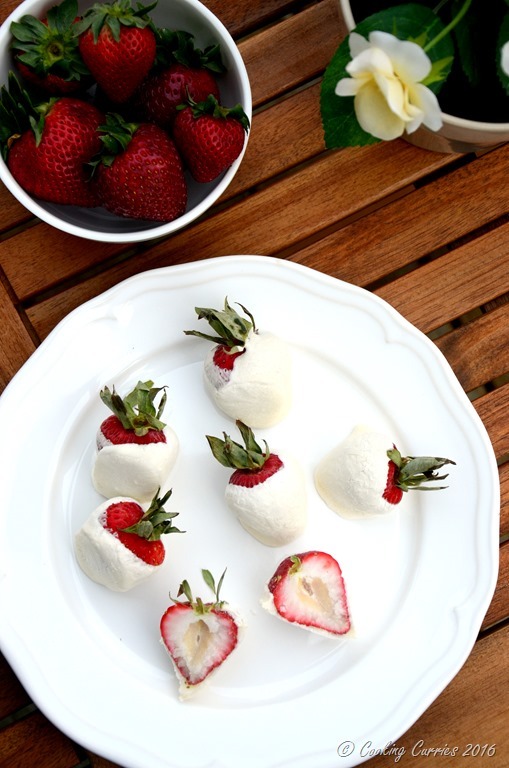 Lightly sweeten the yogurt and even add some vanilla extract to it, dip the strawberries and freeze them. You can even stick a popsicle stick into the strawberry so it is easier for the kiddos to dig into it! Mix the sugar/honey and the vanilla into the yogurt. Line a baking tray, that will fit in your freezer, with parchment paper. 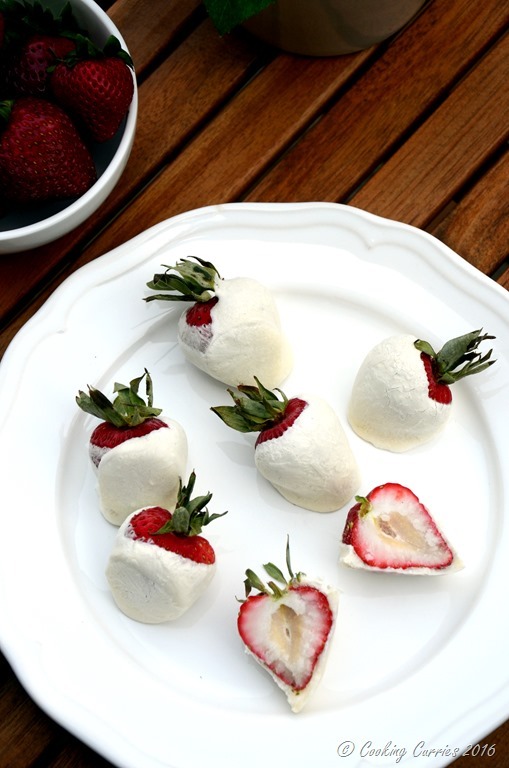 Dip the strawberries in the yogurt to coat well and place on the parchment paper. Pop in the freezer for 45 mins or so till the yogurt freezes. If you want a thicker layer of yogurt, take out he strawberries at this point and dip them again in yogurt and freeze them again.